It rained a lot this weekend, and normally the first rain of the year involves clearing clogged drains from the roof of my flat-topped house. 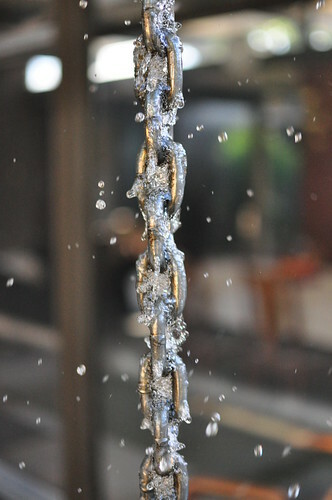 On Monday morning, I cleared the drain for our rain chain, which led to some fun photography, experimenting with different exposures and compositions. It’s rare to have the rain chain going at full tilt in the middle of the sunny day, and the time change meant that 8 am was tantalizingly close to the “golden hour“. These have been hectic times for me, so it’s nice to be able to take a break and just fool around with a camera for a while. 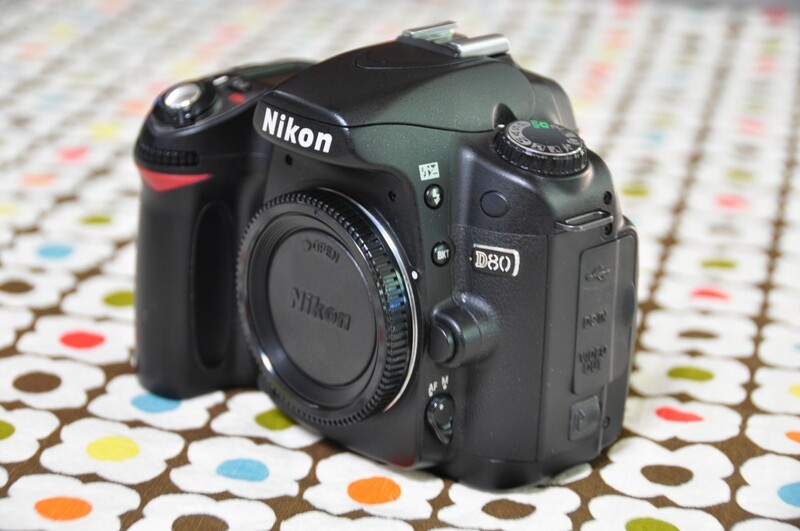 Goodbye Nikon D80, Hello D90! About 2 years ago, I sold my Canon 20D and bought a Nikon D80, largely because I wanted the versatility of the Nikon 18-200 lens. I also appreciated the uncrippled nature of the D80’s semipro feature set in a size and weight more comparable to a Canon Rebel. I also loved the vastly superior Nikon AF system, which lets you designate one of 11 AF points with your thumb and meter from that point, lets me take pictures like this. I loved just about everything about the D80 except for its markedly inferior performance in low light/high ISO to the Canon SLR’s. One feature Nikon’s marketeers really need to tout is the D90’s ability to take great pictures of your old camera so you can sell it for big bucks on eBay. This is the photo as it came from the camera with no post production other than a resize. The Active D-Lighting feature automatically adjusts the shadow and highlight levels of your camera- this means that you can capture good detail in the dark parts of your photos without overexposing the bright parts. It’s a great feature for casual photographers who don’t want to spend a lot of time tweaking photos. ADL does its magic on the raw data from the imager before it gets converted to JPEG, resulting in minimal impact to image quality. Of course, you could get similar results with more control if you shot RAW and did the manipulation yourself, but only if you’re willing to invest the time. This feature wouldn’t be nearly as useful on the D80 because that camera still uses the old CCD based sensor which was known for being noisy in low light. The D90 captures way more detail in low light and high ISO than the D80. I can shoot usable photos at web resolution at up to ISO 3200 where ISO 800 on the D80 was already pretty dodgy. Kudos also to Nikon for not pushing resolution too far on the D90. With only a small bump to 12 from 10 on the D80, this was a wise choice as the low light performance of this camera is considered to be much better than the latest 15 megapixel Canon SLR’s with the cropped sensors. Other things I love about the D90 are the VGA display- a 3 inch display with twice the resolution of an iPhone (and 4x the resolution of the D80) is a sight to behold with incredible detail and good color accuracy. It makes reviewing photos for exposure and focus much easier than before. Live view is also handy for short folks like myself, though I suggest shooting in manual focus mode because Live View AF is very slow. If you’re shooting something far away, it’s usually not an issue. I purchased my D90 for $700 refurbished from J&R Music World and received it in a couple of days. Unfortunately, they seemed to sell out in a couple of hours but it’s worth keeping an eye on them to see if they get more. I sold my D80 for $500 and got a huge upgrade for $200. Even at $400, I’d still do it, but at $200 it’s a no brainer for a camera that is significantly better at still photography while having the bonus feature of 720P video recording.